Life's Journey To Perfection: Sharing Time January 2014: Week 1: I am a child of God and can be like Him someday. Sharing Time January 2014: Week 1: I am a child of God and can be like Him someday. I am excited to this years theme: Families Are Forever! The past few weeks have been crazy getting everything ready. I have been a really big blogging slacker. For my sharing time posts this year I am going to be following these three guidelines as Stated in the sharing time outline book : 1- Identify the doctrine. 2- Help the children understand the doctrine. 3- Help them apply the doctrine in their lives. I am going to begin my posts with a preparation part and then have the instruction part. So here we go with this first sharing time for the year. Identify the doctrine: I Am A Child of God and can Be Like Him Someday. Gather princess items, crown and gown for you to wear. Prepare scripture Psalms 82:6 (print printable crinkle up and roll, so it looks like a scroll). 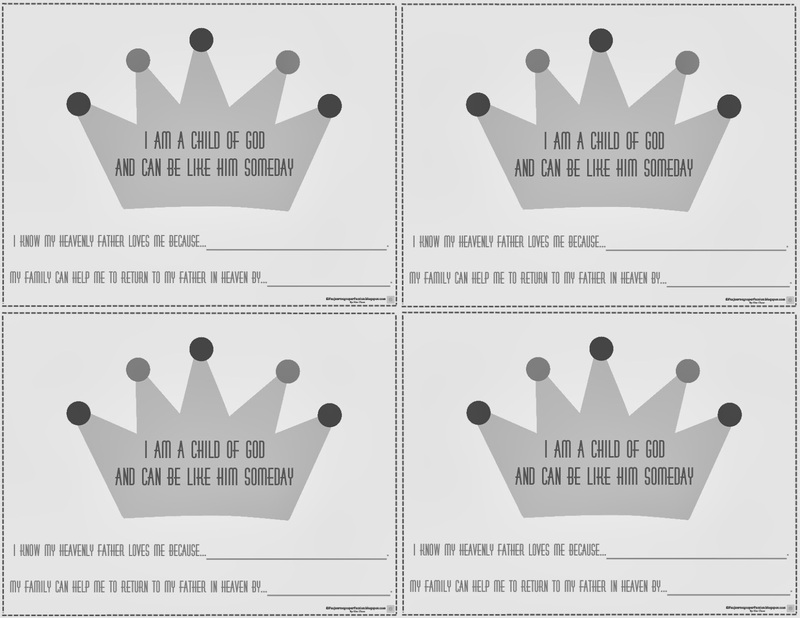 Prepare sign "I am a child of God" printable. Help the Children Understand the Doctrine: Ask pianist to play "I Am a Child of God" or get the music for it. Help them apply the doctrine in their lives: Print enough handouts for each child. Have a pencil or crayon for them to write with. Enter the primary room with our crown and gown on. Explain to the primary children that you were sent here by your Father. Explain to them that your father is a mighty king. That he lives in a place called heaven. That he created the Earth and all of the beauty on the earth. Explain that he created the spirits of all mankind. That he created each one of their spirits, that he is their father also. He created us to be like him. Invite one of the older children or teachers to read a very important message from your father that you brought with you. 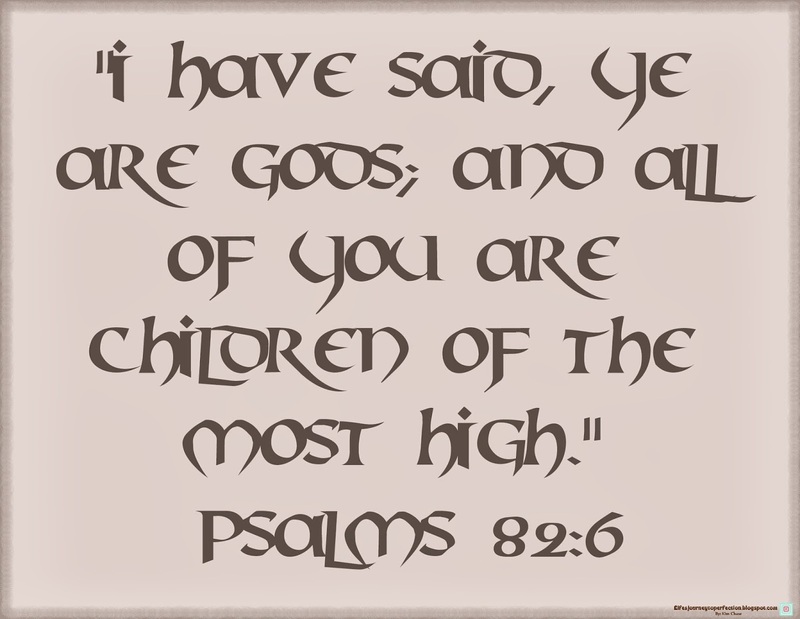 ("I have said, Ye are gods; and all of you are children of the most High." Psalms 82:6). Ask the children what they think that message means? 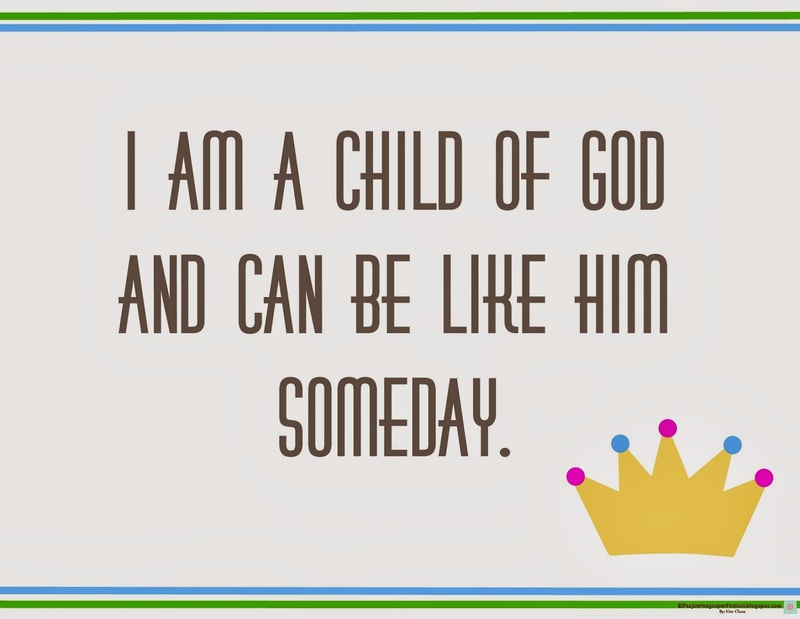 Put up the sign, "I am a Child of God and can be like him someday." Have all of the children repeat those words. Invite the children's to sing the 1st and 4th verses of " I am Child of God". Have them think about what Heavenly Father has given each of them to help them so they can live with him someday. When the song is over ask them what their answer is? It should be families or parents. Give each child a crown print out. Have them each list one way their family can help them to return to their Father in Heaven. And one way they feel their Heavenly Father's love. If time allows have some of the children share their answers. End with your testimony. Your printables are perfect! Thank you so much! I will be following you in the future to see your great ideas!